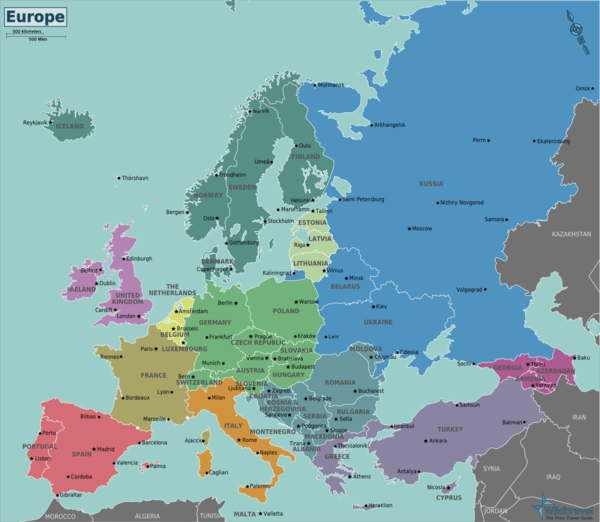 Europe encompasses an area of 10,180,000km² (3,930,000 square miles), stretching from Asia to the Atlantic, and from Africa to the Arctic. European countries welcome more than 480 million international visitors per year, more than half of the global market, and 7 of the 10 most visited countries are European nations. It's easy to see why - a well preserved cultural heritage, open borders and efficient infrastructure makes visiting Europe a breeze, and rarely will you have to travel more than a few hours before you can immerse yourself in a new culture, and dive into a different phrasebook. Although it is the world's smallest continent in land surface area, there are profound differences between the cultures and ways of life in its countries. The eastern border of Europe, for instance, is not well defined. The Caucausus states are sometimes considered part of Asia due to geography, and much of Russia and almost all of Turkey are geographically Asian. The UK, Ireland and Iceland all manage to sneak in. Must-visits include France, Italy, Germany, Spain, and the United Kingdom. Don't let your sense of adventure fail you by missing out on Scandinavia, Greece, Hungary,Poland, Portugal, or the microstates of Andorra, Liechtenstein and Luxembourg. For a more exotic European adventure, be sure to tour the Balkans. Many European countries are members of the European Union (EU), which has its own currency (the Euro) and laws. There are no border controls between signatory countries of the Schengen Agreement (only at the outside borders). Note that not all EU members adopted the Schengen Agreement (open borders) or the Euro, and not all countries that adopted Schengen or Euro are European Union members. Confusing? Just wait! Balkans have a rich, though often turbulent, history with wonderful nature, charming multicultural towns, impressive monasteries and citadels dotting the hillsides, and mountains with beautiful forests, pleasant lakes, and stunning beaches. Three fascinating states that have glorious beaches along an extensive coastline, medieval old towns, and beautiful natural scenery. Estonia has linguistic and cultural ties with Finland. The Netherlands is known for its clogs, cheese, tulips and windmills, and for its liberal attitudes and painters. Belgium is a multilingual country with beautiful historic cities, bordering Luxembourg at the rolling hills of the Ardennes and the Netherlands at the cycling paradise of Limburg. Britain is a diverse patchwork of Celtic and Germanic cultures, possessing a fascinating history and dynamic modern culture, both of which remain hugely influential in the wider world. Ireland has rolling landscapes and characteristic customs, traditions and folklore. Central Europe is the region where Germanic culture meets Slavic culture. It is home to innumerable historic towns, fairy-tale castles, beer, forests, unspoiled farmland, and plenty of mountain ranges, including the mighty Alps and Carpathians. France is the world's most popular tourist destination known for its gastronomy, history, culture and fashion. Some of its tourist attractions include Paris, the French Riviera, the Atlantic beaches, the Alps, castles of the Loire Valley, Brittany, Normandy, and the rural landscape of Provence. Monaco is a beautiful, ultra-wealthy principality overlooking the Mediterranean. Counting the most amount of sun-hours in Europe, the Eastern Mediterranean is a haven for beach-goers, party-people and cultural enthusiasts alike. The Iberian countries are great destinations for their rich and unique cultures, lively cities, beautiful countryside and friendly inhabitants. Russia is a country of vast, empty expanses that spans all the way east to the Pacific Ocean. Ukraine is a diverse country that has a lot to offer, from the beach resorts of the Black Sea to the beautiful cities Odessa, Lviv and Kyiv. North of Ukraine lies Belarus, a country unlike anywhere else in Europe. Spectacular scenery of mountains, lakes, glaciers, geysers, waterfalls and volcanoes. Finland is culturally distinct as it has a language unlike the Scandinavian languages. Copenhagen - Capital of Denmark is a beautiful city which sits in two islands: Zealand and Amager. Riga - the capital of Latvia, is beautiful of its architecture and medieval town. Valletta - the capital of Malta, a true definition of "walking through history". Vilnius - the capital of Lithuania, is an old city with a glorious history. Lagoa das Sete Cidades in Azores , Portugal, a beautiful hour glass green and blue body of water known as a caldera northwest of Ponta Delgada. It is storied with myths and legends. Tara River Canyon - the deepest canyon in Europe is located in the border of Bosnia and Herzegovina (Repubic of Srpska) and Montenegro. The earliest concrete signs of written European culture can be found in Hellenic Greece. Homer (c. 800 BC), Hesiod (753 BC) and Kallinos (728 BC) are three of the oldest poets in Europe. The Romans believed that their city was founded in 753 BC, while modern archaeologists and historians believe that the area of modern day Rome has been inhabited since at least 1000 to 800 BC. From 300 AD Christianity in Europe started to spread. Around 500 the Roman Empire collapsed, with France at that time coming under the rule of the Merovingians, Spain coming under occupation from North African Berber Muslims and other countries essentially invaded by various barbarian groups. In 714, the Carolingian empire was founded and lasted until 911 occupying large parts of Western Europe. The period after this date is often called the high-middle ages and lasted until around 1300 which saw a shift to urbanisation across Europe, initiating in Western Europe, and gave rise to universities. This was followed by the late middle ages which ended around 1500, giving birth to a period of European history normally referred to as the Renaissance or the re-birth. The people of this period actively rediscovered classical Greco-Roman culture and it was followed by a reformation of Christianity, with the rise of new sects in Europe, most notably Protestantism. Between 1492 and 1972 many European nations (like Great Britain, Spain, Portugal, Russia, France and the Netherlands) ruled or had ruled over most of the known world, with the exception of parts of Asia, Japan, Thailand and Tibet) and Antarctica. Europe, prior to the conclusion of World War II, was a region ravaged by large-scale "total war". National leaders realized after World War II that closer socio-economic and political integration was needed to ensure that such tragedies never happened again. Starting with humble beginnings, the EU's first inception was the European Coal and Steel Community (ECSC) in 1951. The founding group of nations were Belgium, West Germany, Luxembourg, France, Italy and the Netherlands. Impressed with the results of the union, the six countries pressed on and in 1956 signed the Treaty of Rome, with the ultimate goal of creating a common market — the European Economic Community (EEC). In 1967, the union was formalised further with a the creation of a single European Commission, as well as a Council of Ministers and the European Parliament. 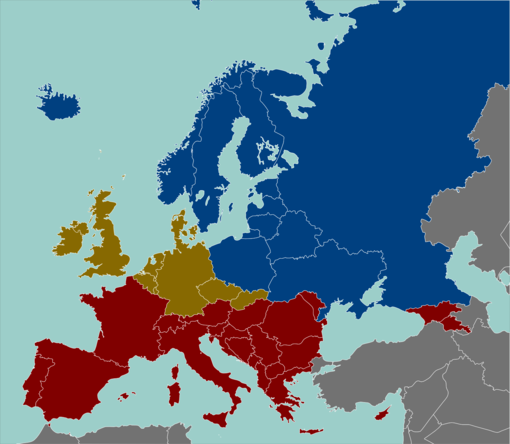 From 1945 to 1990 Western Europe was divided by the Iron Curtain from Eastern Europe. In 1989 protests across Eastern Europe led to primarily non-violent revolutions and in 1991 the Soviet Union was dissolved and the Cold War ended. Post-1967, the EU continued to rapidly grow; Denmark, Ireland and the United Kingdom joined in 1973. Greece joined in 1981, Spain and Portugal in 1986 and Austria, Finland and Sweden in 1995. To date, Norway and Switzerland have resisted membership for historical and economic reasons though both have close relations with the EU. The EU pressed on with economic integration and launched the euro (€) across several nations on 1 Jan 2002. Currently, 18 nations use the euro as their official currency. In addition, San Marino, the Vatican, Monaco, Andorra and Montenegro, which are also not EU members, have been granted official permission to use the euro. In 2004, a further 10 countries joined the EU. These were: Cyprus, the Czech Republic, Estonia, Hungary, Latvia, Lithuania, Malta, Poland, Slovakia and Slovenia. In 2007, Bulgaria and Romania joined; Croatia joined in July 2013, while Albania, Iceland, North Macedonia, Montenegro, Serbia and Turkey are all official applicants. 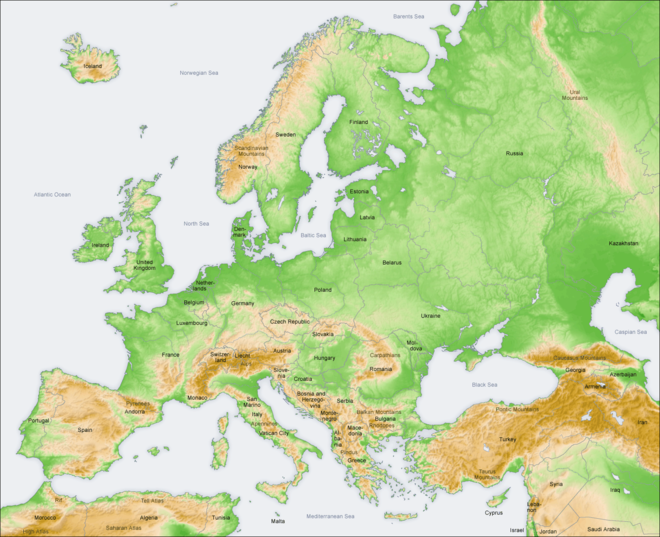 Europe makes up the western one fifth of the Eurasian landmass. It's bounded by bodies of water on three sides: the Arctic Ocean to the north (the Nordkapp being its most northerly point), the Atlantic Ocean to the west and the Mediterranean Sea to the south. The Mediterranean Sea is a popular beach destination because of its climate. Europe's eastern borders are ill-defined and have been moving eastwards throughout history. Currently, the Ural and Caucasus Mountains, the Caspian and Black Seas and the Bosporus Strait are considered its eastern frontier, making Istanbul the only metropolis in the world on two continents. Cyprus is also considered a part of Europe. Europe is a geographically diverse continent. Europe's highest point is Russia's Mt. Elbrus in the Caucasus Mountains, which rises to 5,642m (18,510 ft) above sea level. Western Europe's highest point is the Mont Blanc in the Alps with 4,810m (15,771 ft) above sea level. Other important mountain ranges include the Pyrenees between France and Spain and the Carpathians that run through Central Europe to the Balkans. Most regions along the North and Baltic Seas are flat, especially the Low Countries, Northern Germany and Denmark. The coasts of the North and Baltic Seas feature hundreds of miles of sandy beaches and resorts, albeit in colder climates. Europe's longest river is the Volga, which meanders 3,530km (2,193 mi) through Russia, and flows into the Caspian Sea. The Danube and the Rhine formed much of the northern frontier of the Roman Empire, and have been important waterways since pre-historic times. The Danube starts in the Black Forest in Germany and passes through the capital cities Vienna, Bratislava, Budapest, and Belgrade before emptying in the Black Sea. The Rhine starts in the Swiss Alps and caused the Rhine Falls, the largest plain waterfall in Europe. From there, it makes up the French-German border flowing through Western Germany and the Netherlands. Many castles and fortifications have been built along the Rhine, including those of the Rhine Valley. Europe's climate is temperate. It is milder than other areas of the same latitude (e.g. northeastern US) due to the influence of the Gulf Stream. However, there are profound differences in the climates of different regions. Europe's climate ranges from subtropical near the Mediterranean Sea in the south, to subarctic near the Barents Sea and Arctic Ocean in the northern latitudes. Extreme cold temperatures are only found in northern Scandinavia and parts of Russia in the winter. Average annual precipitation diverges widely in Europe. Most rainfall takes place in the Alps, and in a band along the Adriatic Sea from Slovenia to the west coast of Greece. Other regions with plenty of rainfall include the northwest of Spain, the British Isles and western Norway. Bergen has the most amount of rainfall in Europe with 235 rainy days a year. Most rain takes place in the summer, due to westerly winds from the Atlantic that hit the British Isles, the Benelux, western Germany, northern France and southwestern Scandinavia. The best time to visit Europe is in the summer. In August, the British Isles, Benelux, Germany and northern France have average highs of around 23-24°C, but these temperatures cannot be taken for granted. That's why in the summer many flights go from northern to southern Europe as northerners flee the rain and possible lower than average temperatures. 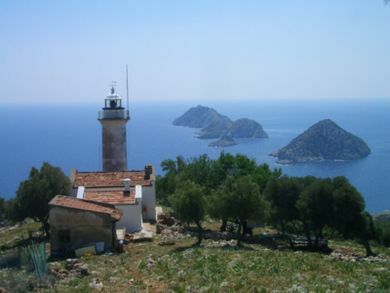 The Mediterranean has the highest amount of sun-hours in Europe, and the highest temperatures. Highest average temperatures in August are 26°C in Budapest, 28°C in Barcelona, 30°C in Rome, 33°C in Athens and 39°C in Alanya along the Turkish Riviera. A general rule is that the further south and east one goes, the warmer it becomes. Winters are relatively cold in Europe, even in the Mediterranean countries. The only areas with daily highs around 15°C in January are Andalucia in Spain, some Greek Islands, Sicily in southern Italy, Malta and the Turkish Riviera. Western Europe has an average of around 4-8°C in January, but temperatures drop below freezing throughout the winter. Regions east of Berlin have particularly cold temperatures with average highs below freezing. Russia is an exceptional case as Moscow and Saint Petersburg have average highs of -5°C and lows of -10°C in January. 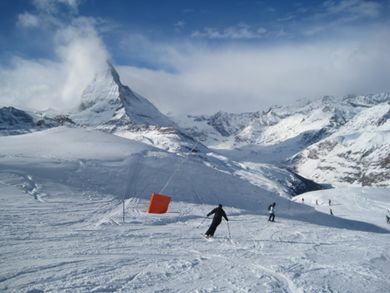 Some activities are best done in the winter, such as winter sports in the Alps. The highest peaks of the Alps have perpetual snow. The Network of European Meteorological Services website provides up-to-date information for extreme weather, covering most of the EU countries. Europe is a continent of many wildly different countries. A subset of these countries are in the slow and painful process of coming together as the European Union (EU). ¹ Official EU applicant countries. 4 Russia uses multiple time zones. EET in Kaliningrad Oblast, MSK (UTC+4) in Moscow, up to UTC+12 on Chukotka and Kamchatka. 5 Officially not a Schengen member, but Schengen visa holders are generally allowed entry. 7 Certain EuRail passes cover these countries (and only the Germany-Poland pass covers Poland), but the general 21-country pass does not. The following countries are members of the Schengen Area: Austria, Belgium, Czech Republic, Denmark, Estonia, Finland, France, Germany, Greece, Hungary, Iceland, Italy, Latvia, Liechtenstein, Lithuania, Luxembourg, Malta, Netherlands, Norway, Poland, Portugal, Slovakia, Slovenia, Spain, Sweden, and Switzerland. Rules for entering Europe depend on where you are going. The EU has announced that it will implement the ETIAS visa program in 2021. EU/EFTA citizens can travel freely throughout the continent (except Russia, Belarus and the Caucasus), so the following applies only to non-EU/EFTA citizens. If you are entering a Schengen country and you plan to visit only other Schengen countries, you need only one Schengen visa. The 90 days visa-free stay applies for the whole Schengen area, i.e. it is not 90 days per country as some assume. Citizens of the above countries who wish to travel around Europe for longer than 90 days must apply for a residency permit. This can be done in any Schengen country, but Germany or Italy are recommended, because many other countries require applicants to apply from their home countries. Please see the article Travel in the Schengen Zone for more information. Non-Schengen countries, on the other hand, maintain their own immigration policies. Consult the country article in question for details. If you wish to visit a non-Schengen country and return to the Schengen area, you will need a multiple-entry visa. 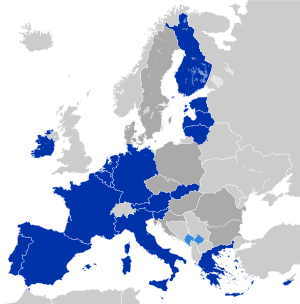 Bulgaria, Romania, Ireland, and the United Kingdom are EU members, but they are not part of the Schengen Area. To add confusion Switzerland, Liechtenstein, Iceland and Norway are not EU members but part of the Schengen area. The implications of this are simple: countries in the EU maintain similar customs controls. Therefore, you do not need to pass through thorough customs when travelling to a non-Schengen EU country, but you may need to pass through immigration controls. The converse is true for non-EU Schengen countries: you must pass through customs (sometimes twice), but not immigration. If ever customs checks are carried out when travelling between two EU countries, the priority of customs officers in such instances is to prevent prohibited and controlled items (i.e. those that pose a threat to public safety, security and health) from crossing the border. The largest air travel hubs in Europe are, in order, London (LON: LCY, LHR, LGW, STN, LTN), Frankfurt (FRA, HHN), Paris (CDG, ORY), Madrid (MAD), Brussels (BRU) and Amsterdam (AMS) which in turn have connections to practically everywhere in Europe. However, nearly every European city has direct long-distance flights at least to some destinations elsewhere, and other smaller airports can make sense for specific connections: for example, Vienna (VIE) has a very good network of flights to the Middle East and Eastern Europe, while Helsinki (HEL) is the geographically closest place to transfer if coming in from East Asia. The Trans-Siberian Railway from Beijing and Vladivostok to Moscow is a classic rail journey. Also after the finalized construction of a railway link between Kazakhstan and China, the Historic Silk Road is becoming increasingly popular with adventurers, trying to beat down a new path, this new Almaty - Urumqi service runs twice per week, and Almaty is easily reached from Moscow by train. Other options include several connections to the middle east, offered by the Turkish Railways (TCDD). There are weekly services from Istanbul via Ankara to Tehran in Iran, and Damascus in Syria, as well as a sketchy service to Baghdad. It is still possible, but expensive, to do the classic transatlantic voyage between the United Kingdom and the United States. The easiest option is by the historic, and only remaining Ocean Liner operator, Cunard Line, but expect to pay USD1,000-2,000 for the cheapest tickets on the 6 day voyage between Southampton and New York done around 10 times per year in each direction. If your pockets are not deep enough for this price range, your only other options of crossing the North Atlantic are pretty much limited to Freighter travel. Most major cruise ships that ply the waters of Europe during summer (June - September) also do cruises in Latin America and Southeast Asia for the rest of the year. That means those ships have a transatlantic journey twice per year, at low prices when you consider the length of the trip (at least a week). These are often called positioning cruises. MSC has several ships from the Caribbean to Europe in April and May. There are several lines crossing the Mediterranean, the main ports of call in North Africa is Tangier in Morocco and Tunis in Tunisia (See Ferries in the Mediterranean for more details), but there is also a little known option of going via Cyprus where you can use Louis Cruises crossings to Port Said in Egypt and Haifa in Israel as a regular ferry service. Keep in mind though, that you can only do this on routes out of Cyprus, and it requires special arrangements - Varianos Travel in Nicosia seem to be the only tour agency offering this option. There are virtually no border controls between countries that have signed and implemented the Schengen Agreement, except under special circumstances during major events. Likewise, a visa granted for any Schengen Agreement signatory country is valid in all other countries that signed and implemented the treaty. Be careful: not all EU members have signed the Schengen treaty, and not all Schengen treaty countries are members of the European Union. See the table above for the current list and the article Travel in the Schengen Zone for more information. Airports in Europe are thus divided into "Schengen" and "non-Schengen" sections, which effectively act like "domestic" and "international" sections elsewhere. If you are flying from outside Europe into one Schengen country and continuing to another, you will clear passport control in the first country and then continue to your destination with no further checks. However, if traveling within the Schengen Area to or from one of the Schengen countries outside the EU, customs controls are still in place. Travel to and from a Schengen Agreement country to any other country will result in the normal border checks. Note that, regardless of whether you traveling within Schengen or not, at some airports, airlines will still insist on seeing your ID card or passport. '*Whilst in theory the EU means no customs checks for the movement of goods for trading, you may still encounter customs officers when traveling between two EU countries. When such happens, their priority is to prevent illegal or controlled items (i.e. items that pose a safety, security, health or environmental risk) from crossing the border. Especially in Western and Central Europe, the trains are fast, efficient and cost-competitive with flying. High-speed trains like the Italian Frecciarossa, travelling the French TGV, the German ICE, the Spanish AVE and the cross-border Eurostar and Thalys services speed along at up to 320km/h (200mph) and, when taking into account travel time to the airport and back, are often faster than taking the plane. The flip side is that tickets bought on the spot can be expensive, although there are good discounts available if you book in advance or take advantage of various deals. In particular, the Inter Rail (for Europeans) and Eurail (for everybody else) passes offer good value if traveling extensively around Europe (or even a single region) and want more flexibility than cheap plane tickets can offer. Beware, however, that it is necessary to make reservations for all high-speed trains in many countries and the number of seats for rail pass holders is very limited, and in addition to having to make these reservations in person at the station in certain countries it is often difficult to go where you want on high-speed train using your pass, especially on the weekends. Unfortunately, there is no single international on-line source of information, especially one that includes new privately run competitors and pricing. One of the most extensive and reliable train travel planners for Western Europe is DB German railways. European Union (EU) Regulation 261/2004 of 17 Feb 2005 gives certain rights to passenger on all flights, schedule or charter and flights provided as part of a Package Holiday. It only applies to passengers flying from an EU airport by whatever carrier, or from an airport outside the EU to an EU airport on an EU carrier. meals and refreshments in reasonable relation to the waiting time. Usually, they will give you a prepaid phone card, and vouchers for a restaurant and a hotel. If your flight is delayed 5 hours or longer you can get a refund of your ticket (with a free flight back to your initial point of departure, when relevant). Like the US, All flights within and from the European Union limit liquids, gels and creams in carry-on baggage to 100mL (3.4 US Fl Oz) containers, carried in a transparent, zip-lock plastic bag no larger than 1L (33.8 US Oz). The bag must be presented during security checks and only one bag per passenger is permitted. Dozens of budget airlines allow very cheap flight deals around Europe, often much cheaper than the train or even bus fares for the same journey. Currently, the cheapest flights are offered by low-cost airlines such as AirBerlin, EasyJet, Eurowings (formerly Germanwings), Norwegian, Tuifly, Ryanair, Vueling and WizzAir. All of these flights should be booked on the internet well in advance, otherwise, the price advantage may become non-existent. Always compare prices with major carriers like British Airways, Austrian Airlines or Lufthansa! Only in very few cases prices are higher than €80 on any airline when booking a month or more ahead of time (except on very long routes e.g. Dublin - Istanbul). You should also make sure where the airport is located, since some low-cost airlines name very small airports by the next major city, even if the distance is up to two hours drive by bus (eg Ryan- and Wizzair's Frankfurt-Hahn, which is not Frankfurt/Main International). For very long distances, traveling by bus may actually be more expensive than traveling by plane. However, bus travel is generally advantageous for shorter trips, trips on short notice, if you wish to see the countryside you are travelling through, if you have heavy luggage, or if you are a proponent of Ecotourism. New bus services are being permitted based on the EU privatisation scheme, offering point-to-point services between major cities on new, very comfortable buses with internet connections, reclining seats, etc at very low rates. Eurolines connects over 500 destinations, covering the whole of Europe and Morocco. Eurolines allows travelling from Sicily to Helsinki and from Casablanca to Moscow. Eurolines buses make very few stops in smaller cities and are generally only viable for travel between large cities. Eurolines offers several types of passes. Each individual journey must be booked in advance of its departure date/time. That means that, depending on availability, you may or may not be able to simply arrive at the bus terminal and board any available bus. The pass works well for travellers who either prefer only to see major cities or who intend to use the pass in conjunction with local transport options. Pass-holders can travel between the following cities: Alicante, Amsterdam, Barcelona, Berlin, Bordeaux, Bratislava, Brno, Brussels, Bucharest, Budapest, Cologne, Copenhagen, Dijon, Dublin, Edinburgh, Florence, Frankfurt, Geneva, Gothenburg, Hamburg, Kaunas, Kosice, Lille, London, Lyon, Madrid, Marseille, Milan, Montpellier, Munich, Nancy, Nantes, Nice, Oslo, Paris, Prague, Rennes, Riga, Rome, Stockholm, Strasbourg, Stuttgart, Toulouse, Tours, Vienna, Venice, Vilnius and Zurich. Through fares are available to destinations on the national networks of some companies, including Touring in Germany. FlixBus - based in Germany with a sizeable domestic network, also has a vast array of international services serving most European countries. As of 2017, FlixBus has Europe's largest intercity bus network. FlixBus also offer an InterFlix pass for €99, which is valid for five single trips across the entire network. Megabus - serves various destinations in the UK and Ireland. Often has the cheapest fares - prices start at £/€1.50 if booked far ahead in advance. OUIBUS - owned by the SNCF, the French state railway company, OUIBUS serves various destinations in France, Italy, Belgium, Germany, the Netherlands, Spain, Switzerland and the UK. Through fares are available to regional destinations in Spain (via ALSA) and the UK (via National Express). Some buses operating to the UK may operate in the livery of National Express. Student Agency - based in Prague, serves destinations across Europe. BerlinLinienBus - owned by Deutsche Bahn, serves much of Germany in addition to Austria, Belgium, Bulgaria, Czech Republic, Denmark, France, Hungary, the Netherlands, Sweden and the UK. Various Eastern European bus companies operate trans-European bus services that are orientated towards Eastern European nationals; many of these companies come and go. The Baltic sea has several lines running between the major cities (for example Gdansk, Stockholm, Helsinki, Tallinn, Riga etc). Most ships are very large, and parallel Caribbean cruise liners in size and in service. In the Atlantic, Smyril Line is the only company sailing to the rather remote North Atlantic islands of Iceland and the Faroe Islands. It sails from Denmark, which also host numerous lines to Norway and Sweden. From the British Isles, a large number of lines still cross the English Channel to France, despite the opening of the Channel Tunnel. There are also a considerable number of ferries from Ireland to both Britain and France. There are also numerous services to Denmark, the Benelux and even across the Bay of Biscay to Spain. Further south there is a weekly service from Portimão to the Canary Islands via the remote volcanic Madeira island. In the Mediterranean Sea, a large number of ferries and cruise ships operate between Spain, Italy and Southern France. And across the Italian peninsular ferries also ply across the Adriatic sea to Croatia and Greece, with Bari as the main terminal (out of many). And finally The Black Sea also has several ferries plying across its waters, albeit service can be fairly sketchy at times. Poti, Istanbul and Sevastopol are the main ports, but nearly all the Black Sea ports have a ferry going somewhere, but rarely anywhere logical - i.e. often along the coast. There are also various ferries on the larger lakes and for crossing rivers. Furthermore, there are several regularly running cruise-lines on the larger rivers like the Rhine, Danube and the Volga. And boating excursions within Europe, particularly along the scenic rivers and between many of the islands in the Mediterranean, are an excellent way to combine travel between locations with an adventure along the way. Accommodations range from very basic to extremely luxurious depending upon the company and class of travel selected. Another famous line is the Hurtigruten cruise-ferries which sail all along Norway's amazing coastline and fjords. The ease of driving on the continent varies greatly, and as a general rule east and west of the old iron curtain are two different worlds. Western European countries for the most part have good road conditions and extensive and well developed highway networks, whereas Eastern European countries are still working hard on the great backlog left behind from communist days. During vacations, especially during summer and Christmas vacations, driving on the highways can be hellish, particularly in Germany (listen for the word Stau = traffic jam in the automated traffic broadcasts). 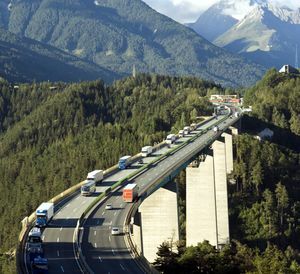 Europabrücke (Europe's bridge)is a 777m (2,549.2 ft) long bridge spanning the Wipp valley just south of Innsbruck, Austria. There are no uniform speed limits across the union, the fabled limitless German autobahn is now limited to mostly rural sections. The majority of motorways/freeways have an 110-130km/h (70-80mph) speed limit, while the limit on undivided highways varies between 80 and 100km/h (50-65mph). For North Americans, a major difference is the left lane on highways where traffic drives on the right, which is not the "fast lane" you're used to, but rather the "passing lane" and it's illegal to overtake on the right, so you should only occupy the inner lane when you are overtaking someone; stay there, and you will have other vehicles tailgating while flashing their lights in annoyance and traffic police eager to fine you. Remember to use turn signals when changing lanes. Except for priority streets (check the symbol in the table) there is a general duty to give way to traffic from your right in crossings and intersections that are not marked, and other drivers have every expectation you adhere to this. This also applies to unmarked T-intersections, unlike in North America where the ending road should normally yield to the through road even if unmarked. But in the ubiquitous roundabouts (circles) you find everywhere across the continent, cars already in the circle have the right of way when indicated by triangular give way signs aimed at drivers approaching the roundabout (check the symbol in the table), this is practically always the case. Remember to indicate when you're leaving a roundabout. Don't do right turns on red lights (unless the light features a green right arrow sign, in which case right turns on red are permitted), it's illegal, and because it's not common practice, also dangerous. Bicycles have the same status as cars, though this may vary a bit per country, a cyclist coming from the right, for example, has right of way. Avoid large cities, for example London, Paris, Rome, Athens, Belgrade and Moscow, if you are not used to driving in Europe. Their centres were built long before the introduction of the automobile and were not meant to cope with the levels of traffic common these days. The streets are often narrow and difficult to drive on. So, for the most part, it may be a slow, frustrating and potentially dangerous experience, and even then, finding a parking spot can potentially take a long time and be surprisingly expensive when you find it. Instead, park at the outskirts of town, where it is often free, and use the typically extensive and efficient public transit system to reach the centre. In some cities, there are good parking spaces near major public transport stations marked P+R or Park and Ride for free or a symbolic price when you have a valid public transport ticket (however they are also often full during work hours). If you are renting, try to work around having a car while visiting large cities. Age: Almost everywhere, especially in the EU, you need to be 18 years old to drive, even supervised, and in countries with Learning schemes, it's usually an exhaustive procedure to get a permit, and rarely applicable to foreign citizens anyway. Exceptions include Portugal, Ireland, and the UK. A warning triangle is compulsory nearly anywhere, and so is using it in the case of breakdowns. Hi-Visibility (reflective) vests are compulsory in Austria, Belgium, Bulgaria, Croatia, France, Germany, Italy, Norway, Portugal and Spain and gaining popularity elsewhere. Headlamp Adjusters are also compulsory equipment in most countries, but in the U.K. and Ireland only if you are driving a continental car. A black and white, 1-3 letter country identity sticker is compulsory for cars without EU license plates. International driving permit, while it's not compulsory for certain nationalities in some European countries, it's cheap, and could potentially save you from nasty incidents with authorities. If you want to cross a border with a borrowed car, in most countries you need to have a written consent with you. This applies to rented cars as well as cars borrowed from your friend if that friend is not traveling with you. Most European countries require all passengers to wear seat belts at all times. In many countries children under 12 years of age have to use a child safety seat. If you plan on renting a car for driving across Europe, it often makes sense to check the rates in different countries rather than just hire a car in the country of arrival. The price differences can be very substantial for longer rentals, to an extent where it can make sense to adjust your travel plans accordingly. I.e. if you plan on traveling around Scandinavia by car, it will often be much cheaper to fly into Germany and rent a car there. Beware that you usually need a written consent before you can cross a border with a rented car and some rental companies do not provide that (and their insurance is not valid abroad!) while others charge extra. Compared to North America, you should be prepared for smaller but more efficient cars, and most of them have manual transmission, so don't expect an automatic without requesting one while placing your order (and often paying extra). In any case driving in Europe is a expensive proposition, gas prices hover around €1.30-1.80 per litre (USD7-8 per US gallon) in much of Europe, while often somewhat cheaper in Russia. Rentals are around 2-3 more expensive than in North America. Highway tolls are very common and a variety of systems is being used, city centre congestion charges increasingly so, and even parking can work up to €50 (USD70) per day in the most expensive cities. Driving can be an enjoyable and feasible way to see the countryside and smaller cities, but most Europeans would find a vacation to say, Paris, Brussels, and Amsterdam, in a rented car completely laughable. European cycle route network Eurovelo consists of 14 routes linking virtually every country on the continent. Some of these routes are not finished yet, the plan is to have 60,000 km of bike lanes, now around 45,000 is in place. Eurovelo 6 - Rivers Route. 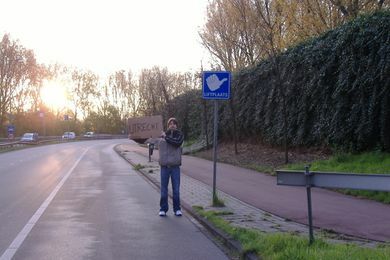 Hitchhiking is a common way of traveling in some parts of Europe, especially in former eastern bloc countries. It can be a pleasant way to meet lots of people and to travel without spending too many euros. Don't forget to check out the tips for hitchhiking. Note that in the former Eastern bloc, you may run into language problems while hitchhiking, especially if you speak only English. It is not advisable to hitchhike in former Yugoslavia, for example between Croatia and Serbia, because you could run into big problems with nationalists. Between Croatia and Slovenia, it's usually not a problem. In Moldova, Romania, and Ukraine, hitchhiking is a common way of transport (you might even have to queue up). It's easier to take train or bus because of the low rates and the fact that drivers usually expect to be paid. In Western Europe, especially in the Netherlands and Germany, it's highly uncommon (the Dutch and many German county governments issue free public transport to students enrolled in local universities) but easy and fast to hitchhike. In most countries, it is forbidden to hitchhike on highways. English proficiency varies greatly across the continent. In the United Kingdom, Ireland, Gibraltar, Cyprus, Malta, the Netherlands and Scandinavia, nearly everyone is able to communicate in English with varying degrees of fluency. German-speaking areas (particularly in Austria, German provinces of Switzerland and the former West Germany), Estonia, Greece and the Flanders region of Belgium are also good bets for English, though you may need to bear with heavy accents. Outside these areas, English proficiency will primarily be a function of age, educational attainment (i.e. those who are currently studying at or have recently graduated from university will likely be more proficient), proximity to the city centre and whether they work in tourism-related industries. A bit of German and Russian may be known by older generation of people who grew-up in the former Eastern Bloc. If you can read German reasonably well, you may also be able to understand the writings in Dutch and Scandinavian languages. Speaking or reading Latin or one of the Romance languages will likely help you a great deal in Portugal, Spain, France, Italy and Romania, while the same is true if you speak one of the Slavic languages in the East. If you need assistance, look for someone young, under the age of 40 or even better under the age of 30, as this greatly increases your chances of locating an English speaker, although in Scandinavia English is spoken by nearly everyone regardless of age, and many older German and Dutch speakers know some English as well. Alternatively, hotel staff can be another option, especially in areas where few locals speak English, even if you don't stay at their hotel. Hiring a tour guide will also help you overcome the language barrier so arrange for one while preparing a trip, especially if you're travelling in groups and visiting far flung rural areas where English or your preferred language will be more unlikely to be understood. The all too common concept of trying to "do Europe" is pretty unrealistic, and might make it less enjoyable for some. While it is true that Europe is compact and easy to get around with efficient infrastructure set up everywhere, as previously mentioned, it also has more preserved history packed into it than virtually anywhere else. There are more than 400 world heritage sites on the continent, and that is just the very tip of the iceberg. So, depending on your travel style, you might consider foregoing the mad dash through Europe in an attempt to get the ritual photos of you in front of the Colosseum, the Eiffel Tower, Big Ben etc. over and done with. The key is to prioritize, pick 2-3 sights you really want to see per week, and plan a route from that. There are likely to be some amazing, world class sights and attractions that you haven't even thought about somewhere in between two given cities, and finding those will be infinitely more rewarding than following the beaten down post card route if that's what you prefer. Use your best judgment. Europe was home to some of the world's most advanced civilisations, which has led to an astonishing cultural heritage today. Ancient Greece has been credited with the foundation of Western culture, and has been immensely influential on the language, politics, educational systems, philosophy, science, and arts of the European continent. Ancient Greek structures are scattered over Greece and Turkey, including Delphi, Olympia, Sparta, Ephesus, Lycia and of course the Parthenon in Athens. Ancient Greece was followed by the Roman Empire, one of the greatest civilisations in the world that took hold of large swathes of Europe, North Africa and the Middle East. Visiting Roman ruins in Rome is a no-brainer, with the magnificent Colosseum, Pantheon and the Roman Forum. Many Roman ruins can also be found in Spain, such as the remains at Merida, Italica, Segovia, Toledo and Terragona. With 47 sites, Italy has the most UNESCO World Heritage Sites of any country in the world, directly followed by Spain with 43. Despite an ever growing competition from the United States and nations with new found wealth, Europe is still the spiritual home of classical music and Opera, and the various European capitals are home to some amazing 'old world' opera houses, where the hundreds of years of history, often enhances the experience into something otherworldly. But if opera singers give you a headache, and you would much rather head-bang, fear not, Europe has more music festivals than your liver will ever hold up to; the Roskilde Festival in Roskilde, the Sziget fesztivál in Budapest and, finally, the reigning champion Glastonbury in England weighing in at 195,000 drunk souls, are widely considered the 3 big ones, but many other ones are not the slightest bit small. Alternatively, there is the revival festival in Poland, Woodstock while it doesn't boast the star-studded line-up of some commercial festivals, is great for those who want to do it on the cheap (there is no ticket to buy) and attracted 700,000 music fans in 2011. Perhaps no other field has seen stronger European integration than sports, most professional sports have Europe wide leagues in place, and nearly every sport has a bi-annual European Championship. Football (always means soccer in Europe) If you are already a football fan the game hardly gets any better than watching your favourite team battle it out against the world's greatest football clubs in the Champions League or the Europa League. Football fans gather together in pubs or at home to watch the games, often wearing scarves of their favourite teams. Games in the pan European leagues usually takes place mid-week to allow for games in the national leagues to take place during the weekend. For the popular teams the tickets are often sold out weeks in advance. Basketball The pan European Euroleague is the highest tier of professional basketball in Europe, featuring teams from 18 different European countries and some of the best basketball you'll find outside the NBA. The regular season runs Oct-Jan and play-offs takes place between Jan-May. Handball Also sees a annual pan European tournament, the Champions League taking place every year. While the sport is little known outside Europe, it's one of the most popular sports on the continent. Two teams with seven players each pass and bounce a ball to throw it into the football-style goal of the opposing team. Cycling Is another sport the enjoys much wider popularity in Europe, than virtually the rest of the world. Hundreds of competitions takes place every year, but the 3 unrivalled events of the year is the Tour de France, the Giro d'Italia and the Vuelta a España, where thousands of thousands of spectators line up along the often hundred kilometre plus routes. The whole season is managed in a league like format called the Protour. Volleyball is also a very popular sport with European Volleyball Championship organized biannually. Paragliding Europe is home to some of the most popular paragliding sites in the world. Oludeniz in Turkey, Interlaken in Switzerland, Praia a Mare in Italy just to mention a few. American football is almost non-existent in Europe, the closest popular sport being rugby. Europe is home to some fantastic ski resorts; the Alps are home of some of the best ski resorts in the world, and there are more here then anywhere else. Austria and Switzerland, contain hundreds of resorts alone. Other Alpine ski destinations include, France, Italy, Slovenia, Germany (Bavaria) and even tiny Liechtenstein. The largest area is Les Portes du Soleil, made up of 13 linked ski resorts in Switzerland and France, boasting over 650km of marked runs. But the fun doesn't stop in the Alps; The Scandinavian Mountains features some of the worlds most civilized and family oriented Skiing areas, but the lower altitude also means it's a trade-of for shorter runs - Åre is the biggest, while way up north Riksgränsen allows skiing well into the summer. Scotland is home of 5 ski resorts: Nevis Range has the highest vertical drop at 566 metres, while Glenshee is the largest. A surprising option is Sierra Nevada in Spain, fairly large, just hours drive from the Mediterranean coast, and with a season often running into May - you can ski in the Morning, and chill on the beach in the afternoon. To the North the Pyrenees shared with France and Andorra also offers excellent skiing in up to 2,700m (8,000 ft) altitude, Domaine Tourmalet is the largest resort in the area with over 100km of pistes. Eastern Europe is seeing increasing popularity since prices are much lower than elsewhere on the continent, the downside is that facilities are not as expansive or modern as elsewhere in Europe, but things are rapidly improving. Slovenia is cheap alternative in the über- expensive Alps, Kranjska Gora is the largest resort in the country. The Carpathian mountains with the highest runs at almost 2200m (7200 ft) is another popular area; Poiana Brasov (Romania, 20km, 11 lifts ) Zakopane (Poland, 30km, 20 lifts) and Jasna (Slovakia, 29km, 24 lifts) are the largest and most popular areas in the respective countries. There are more than 360 national parks  on the continent, which is not a surprise since Europe is the world's second-most densely populated continent. Many parks are small, some less than a single square kilometre, but there are also some expansive national parks to explore. The Vatnajokull National Park on Iceland is the largest, covering around 12,000km² (7,500 square miles), and the fascinating national parks of the Arctic Svalbard are not far behind, while Yugyd Va National Park in the Russian Urals is largest on the mainland itself. In total the national parks of Europe encompass an area of around 98,000km² (37,000 sqare miles). Many cities in Europe are great for cycling. Europe has several places for whitewater sports and canyoning. The euro (Symbol: €, ISO 4217 code: EUR) is the common currency of many countries of the European Union. One euro is divided into 100 cents; sometimes referred to as 'euro cents' to differentiate them from their US and other counterparts. Established in 1999 and introduced in cash form on 1 Jan 2002, the euro removes the need for money exchange. As such it is not only a boon to pan-European business, but of course also to travellers. Each member nation has a unique design at the back of the euro coins minted in their country. Rest assured that regardless of the origin of the designs at the back, the euro coins are legal tender anywhere throughout the Eurozone. The euro has not been adopted by all EU countries. Those countries which have replaced their own national currencies are commonly called the Eurozone. By law, all EU countries (except Denmark and the United Kingdom) have to eventually adopt the euro. In practice, though, plans for this in the remaining newcomer EU states are often put on hold pending the outcome of the current economic crisis facing Europe. Outside the EU, Andorra, Kosovo, Monaco, Montenegro, San Marino and the Vatican have unilaterally adopted the euro. All of these nations, except Kosovo and Montenegro, are allowed to mint a limited amount of national Euro coins. Because these are so rare, they are often worth more than their face value, so are prized by collectors. Andorra was due to release its own Euro coins in July 2013, but this has since been delayed. All other countries in Europe still retain their own currencies. Euros are widely accepted in European countries outside the Eurozone, but not universally, and at shops and restaurants the exchange rate is rarely in your favour. Many hotels, however, price and accept payment in euros. Also, a large number of filling stations and motorway service areas in European countries outside the Eurozone accept the euro, and both Croatia and Serbia allow payment of highway tolls in euros. Money changers will generally give good to excellent exchange rates for the euro, and in a pinch they will be accepted by nearly everybody. Do not accept any of the obsolete currencies. While several countries' banks will still change them into euros, it's a lot of hassle and there is no guarantee that this will be possible everywhere or on short notice. You should also expect to leave your personal information with the bank as a precaution against money laundering. Throughout Europe, automatic teller machines are readily available. They will accept various European bank cards as well as credit cards. However, be prepared to pay a fee for the service (usually a percentage of the amount withdrawn, with a minimum of few euro) which may be in addition to the fees your bank already imposes on foreign withdrawals. Read the labels/notices on the machine before using. Credit/debit card acceptance is not as universal as in the United States, especially in Eastern Europe, but growing steadily. VISA and MasterCard acceptance is most widespread in the UK, France, Norway and Sweden. In mainland Europe, merchants, if they accept credit/debit cards, may require you to spend a minimum amount. Even if you see a card machine at the till, it doesn't mean that an internationally-recognised card like VISA or MasterCard will be accepted; a number of merchants in mainland Europe only accept local cards (ie without the AmEx, MasterCard or VISA logo). Some countries mandate that merchants check your ID for purchases of as little as €50, and many shops will insist on ID for any credit card transaction. If your credit card is billed in a different currency or debit card is linked to a bank account also of a different currency to the country you are visiting, you may face foreign exchange transaction fees so check your card issuer. An increasing number of European countries, notably the UK, France, the Netherlands, Belgium and the Nordic countries, have moved to a chip and PIN system, where credit cards all have a chip built in and you have to punch in your PIN code instead of signing a receipt. Any store that displays Visa, MasterCard, Amex etc logos is required to accept "traditional" sign-and-swipe cards, so be persistent if they initially refuse, although you may need to escalate the problem to the manager. (With most terminals, swiping your card and simply waiting 20 seconds without entering the PIN will cause them to print out the signing slip.) However, with self-service like gas pumps and ticket vending machines, you may be out of luck. With 50 intricately linked countries and 28 currencies squeezed into an area roughly the size of Canada or China, the planet's largest diaspora due to the continent's colonial ties with virtually the entire world, and more tourism arrivals than anywhere else, currency exchange is a fact of life in Europe, and the market is probably better established than anywhere else in the world, and readily available nearly everywhere. Banks will almost always exchange all European currencies, and within the European Union banks will accept nearly any currency that is legally traded abroad. Specialized currency exchange companies are also widespread, especially in major tourist destinations, and are often slightly cheaper than banks. However, with ATM's accepting all major credit and debit cards available everywhere, many visitors simply withdraw money electronically to get as close to the real exchange rate as possible. The EU is generally expensive for most visitors. When buying souvenirs, it costs substantially less to purchase from smaller stalls than the stores affiliated with larger establishments. As for dining, most service items that are complimentary in your home country (e.g. water, bread) may not be so in this continent. However most goods and services offered in the region are required to include value added tax (VAT) in their published prices, especially the large print. The VAT is (at least partially) refundable if you are a non-resident, spend a minimum amount in a particular shop in one day, and intend to export the goods you purchased outside the EU; just make sure you request for a voucher from the store and show them to customs at your exit point. To be safe, be on the lookout for a VAT refund sticker at the door or window of the store and bring your passport (sometimes a photocopy will suffice) during shopping trips. In some cases, tax free agents such as Global Blue and Premier have in-town offices where you can 'advance' your tax refund in cash: have a credit card, passport and vouchers ready, and you still need to have paperwork processed at your airport of departure from the EU (otherwise, your credit card will be charged accordingly). A term “European Cuisine” could reffer to more generalized term of “Western Cuisine”, or to common characteristics of various cuisines of Europe. The biggest similarity between these countries is that the meat plays important if not central part of their dishes, as well as dressings, seasonings and sauces. Potato dishes or wheat bread stand for what rice represents in Asian culture. There is a vast use of olive and sunflower oil and butter in cooking. Portion sizes tend to be larger then in Asia and smaller than those in USA. French, Italian and Greek cuisine have received a worldwide acclaim. France might be the best place to eat cheese, bisque, foie gras, crème brûlée, crêpe, macaron, baguette, croque monsieur, escargot, cheese fondue and confit de canar. Italy is famous for pesto, pizza, the biggest world selection of pasta (most famous being spaghetti and ravioli), mozzarella, prosicutto di Parma, pancetta, risotto and tiramisu. In Greece the most favourite to eat are moussaka, Greek salad, pita-bread, different kinds of mezedes (appetizers), tzatziki yogurt, Greek yogurt, feta cheese, gyros and souvlaki. In Russia you can find beef stroganoff, blini and borsch, in Germany bratwurst and currywurst, in Austria weinerschnitzel, in the Netherlands stroopwafel, while Spain in known for tapas. Turkish and Arabic food is spread throughout the continent due to migrations. In recent times the diaspora has spread Serbian cuisine across the continent. Its is praised for its mild, fresh and natural flavours, and the freshness and good quality ingredients. It is described as a mighty combo of Mediterranean, Central European, Slavic, Turkish and Arabic cuisines. Europeans generally have liberal attitudes towards drinking, with the notable exception of Scandinavia (excluding Denmark). The legal drinking age varies between 16-18 in most countries, often with differentiated limits for beer and spirits. In most places in western Europe drinking in public is both legal, and a common warm weather activity, and police are more likely to give a warning and send you to bed than issue fines for drunken or rowdy behaviour. In most Eastern European countries drinking in public is forbidden, although still pretty common. Except on the British Isles, the nightclubs rarely get going until past midnight. Head for the bars and restaurants to find people until then. Europe is by far the biggest wine producing region in the world, France is the biggest and most famous, but 5 of the 10 largest wine exporters are European Nations; France is followed by Italy, Spain, Germany and Portugal, and nearly all European nations have wine production of some scale. Wine production was started 4000 years ago by the Minoan civilization in present day Greece, and was spread across Europe by the Phoenicians and later the Romans. Unlike other regions, European wine producers place much more emphasis on tradition and terroir than on the grape variety, and wines in Europe will typically be labelled by region rather than by its grape variety (such as Chardonnay), unlike the common practice elsewhere. This is because European wine producers claim that their long history have allowed them to adapt production techniques to the unique conditions of their particular region, and things like the soil composition for a region also has much influence on the taste of the wine. Some of the best and most famous wine regions of Europe includes Bordeaux, whose name is as synonymous with its wines as the large city. Another famous French region producing excellent wines is Burgundy (Bourgogne) around the city of Dijon, it produces both red and whites - the most famous ones, often referred to as Burgundies, are red wines made from Pinot Noir or white wines made from Chardonnay grapes. Further north, the Alsace region close to the Germany, and Mosel across the border - grown on some of the continents most dramatic wineyards on very steep hills, are above all known for their excellent white wines. Further to the south, Tuscany in Italy is famous for its Chianti wines made from Sangiovese grapes, while La Rioja is arguably the most popular, and certainly among the best, Spanish wine regions. While wine is the most popular alcohol in Southern Europe, beer is the national drink for much of Western Europe. Germany, the Netherlands, Belgium and the Czech Republic makes some of the finest brews in Europe and maybe the world. Visitors from many countries, especially those from East Asia or North America will find that European lagers have a richer stronger taste, and often a higher alcohol content than found at home. In Europe as elsewhere, the most popular beers are lagers, also known as Pilsner after the Czech city of Pilsen that originated the style. The United Kingdom, Ireland and partly the Belgian abbey breweries, on the other hand have strong brewing traditions in ale, which is brewed using quickly fermenting yeast giving it a sweet and fruity taste. Most European nations have a national brand; like Carlsberg, Heineken or Stella, sold most everywhere - but the really good beers are often the smaller brands, which doesn't try to appeal to everyone. In recent years microbreweries have had a huge revival shooting up everywhere around the continent. If you really want to indulge, try one of the beer festivals, held in many German cities, the most famously Munich Oktoberfest (where they start drinking already in late September!). Another northern European favorite is cider, most commonly brewed from apples and sold both bottled and on tap in pubs. Taste and alcohol content can vary widely, from dense, cloudy and strong (8% or more) to light, weak (under 4%) and occasionally even artificially flavored. Like elsewhere on the planet; Vodka, Rum and Gin is available everywhere. Scandinavia (except Denmark), Eastern Europe and Russia especially have an affection for Vodka, and if you've so far only tried the usual suspects like Smirnoff or Absolut; you should try the Vodka there, you may just end up surprised at how tasty the stuff can actually be. Elsewhere, most regions have a local speciality that local drinking comrades will happily fill in you, and eagerly wait for your funny faces when your throat and taste-buds screams in agony. Most likely it will be Slivovitz (also called Rakia) in South-eastern Europe and the Balkans (especially in Serbia), a strongly tasting and fruity brandy, usually made from plums. Other forms of brandy, made from grapes instead, such as traditional Brandy, Cognac or Port wine are popular in the UK and South-western Europe. Greece and Italy makes the popular Ouzo/Sambuca which along with the related, resurgent Absinthe, is made from star anise and sugar, giving it a liquorice like taste - watch for the many party fire tricks related to those drinks. In northern Europe you'll likely be served Schnapps (or Snaps, Aquavit), usually made from fermented hops or potatoes accented by traditional herbs like dill or sloe, be careful, it suddenly kicks in without much warning. Finally, it will hardly come as a surprise to many that Whiskey (or Whisky) is popular with the Scots and Irish. While all these drinks have strong regional roots, you'll generally find one or two types of each, in virtually any bar on the continent. For emergencies you can dial 112 in any EU member nation as well as most other European countries - even when it is not the primary number for emergency services. All 112 alarm centrals within the EU are legally required to be capable of patching you through to an English speaking operator. 112 can be dialled from any GSM phone, even locked phones or, in most countries, phones without a SIM installed. The biggest risks to your safety in Europe like in any major tourist area are pickpockets and muggings. Using common sense and being aware of your surroundings can help to greatly reduce the risk of these occurrences. Remember alcohol is an integral part of many European cultures but overuse can lead to violence and poor judgement! In general, bars and pubs are not a place where alcohol causes these problems in Europe but it can end up being a big problem on the roads. Most European countries have very low levels of violence compared to the United States. The main issues are drug use and gang related violence which is most likely in Britain and France, but it's virtually unheard of for any tourists to be involved in such issues. The few "trouble areas" that should be avoided are the run-down suburbs of certain urban areas (particularly in Europe's largest cities) and some places in eastern and southern Europe do have much higher violent crime rates, and can be very dangerous for non locals, but these areas shouldn't be of interest to the average tourist. Central and Western Europe are generally the safest regions. Europe may be very urban and densely populated in general but as always when travelling in rural and forested / mountainous areas take the proper precautions. All it takes is one wrong turn down a ski piste and you are stranded. Time to take out the mobile phone. Did you bring one? There are no specific precautions required for staying healthy in Europe as most restaurants maintain high standards of hygiene and in the majority of countries tap water is safe to drink. However, for more precise details on these matters as well as for general information on emergency care, pharmaceutical regulations and dentistry standards etc, please consult the 'Stay safe' section on specific country articles. EU/EEA citizens should apply for (or bring) the free European Health Insurance Card (EHIC), which grants you access to state-provided healthcare within the European Union as well as Norway, Switzerland and Lichtenstein either at reduced cost or free of charge, under the same terms as a resident of the country you are visiting. If you are used to free healthcare in your own country, remember that some member states expect patients to pay towards their treatment, and you may be expected to do the same. And do remember that the EHIC does not equal a travel insurance; it doesn't cover private healthcare, the cost of mountain rescues or repatriation to your home country. Neither does it allow you to go abroad specifically to receive medical care. If you are not a EU/EEA citizen, remember to buy a travel insurance policy, while some countries do provide free emergency care for visitors, any follow-up treatment and repatriation is your own responsibility, and some countries expect you to foot the entire bill for any treatment yourself - the fabled universal healthcare system does not equal free treatment for non EU citizens. Those who need a Schengen visa are required to get travel insurance that covers the entire Schengen zone for the duration of the trip and coverage for emergency care and medical repatriation must be a minimum of €30,000. This page was last edited on 18 March 2019, at 19:03.